If you want to learn to play Hello on the saxophone, you might order the sheet music online and read through it. If you are a strong music reader, this may work well for you, but you’ll be limited in many ways. Read on to discover a better method for learning melodies to popular songs that will be easier, more musical, and allow you much more flexibility as a musician. Hello by Adele is another example of a popular song melody that is almost entirely made up of notes from the pentatonic scale. Songs like this are easy to learn by ear. 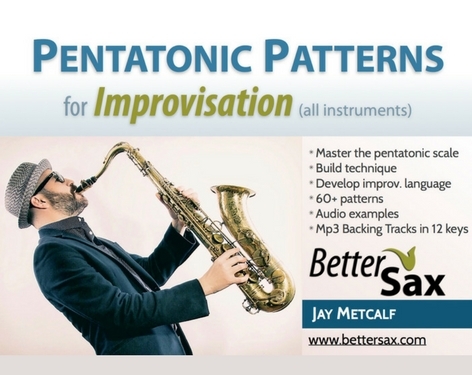 If you are taking the Pentatonic Foundation Course, you know that the pentatonic scale is the foundation for tons of popular song melodies and can be used as a tool for improvising your own saxophone solos. Instead of reading sheet music to learn Hello on the saxophone, I recommend you try my play by ear method. You might be surprised at how quickly you are able to play the melody to Hello entirely by ear. Learning melodies in this way will also allow you to quickly memorize them. Watch my 3 minute video overview that quickly outlines the process. In this video, I am playing the melody on alto saxophone. There is an 8 bar interlude section at the end where I play an improvised solo using mostly pentatonic scale material. Learn the corresponding pentatonic scale for your instrument and memorize it. 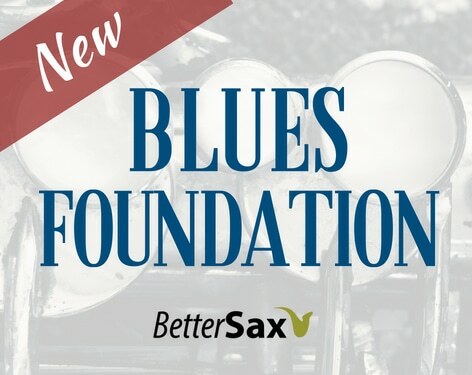 If you don’t already know how to play and build a pentatonic scale, you can learn about this in my free Play Sax By Ear Cheatsheet. The melody to Hello is based on the major pentatonic scale. Every note in the melody (except for 2 passing notes) come from this 5 note scale. If you play the alto or baritone saxophone this will be an F major pentatonic scale. In the examples above, I have indicated the names of the notes in case you are not a strong sheet music reader. I have also indicated each note’s corresponding number as it relates to the major pentatonic scale. Memorize these 5 notes and how they sound. From now, on only play this scale from memory. Now that you’ve memorized the 5 notes of the major pentatonic scale, practice it up and down your instrument using your entire comfortable range. This means extend the scale beyond the first octave up to the highest note you can play on your instrument (that is one of the 5 notes in the scale). 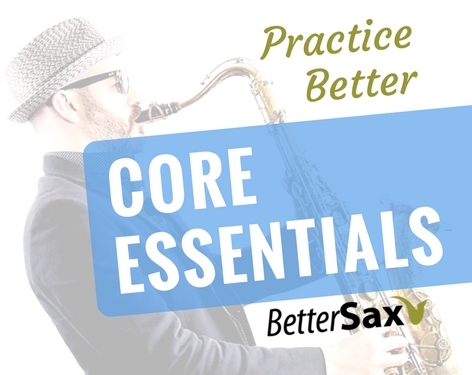 Use a metronome for this and all technical practice on your saxophone. We need to practice our pentatonic scale in this way because, as you will see, melodies are rarely contained within the range of a single octave. I suggest you set your metronome to 70 bpm and play the scale as written above with 2 beats per note. If you can do that smoothly, in tempo and without mistakes or hesitation, increase the tempo gradually. Do this in increments of 5 or 10 bpm until you get to 140. Then set the metronome back to 70 and play one note per beat (quarter notes). Repeat this process until you double the speed again and can play 2 note per beat (eighth notes). You can use the above method to increase your technique and learn to play faster. Don’t be in a rush though. This is a process that requires regular practice over a long period of time. Always make sure you are playing rhythmically and in time with the metronome. There are video lessons where you can play Pentatonic Exercise 1 along with me at different tempos in the Pentatonic Foundation Course. I’ll give you the starting note for each section and you figure out the rest on your own. The best way to do this is to listen to the original recording and play along. Pause and repeat sections as necessary. 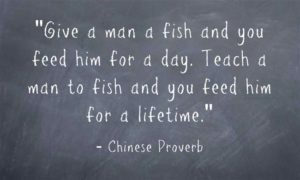 I know this may sound like I’m not really helping you learn this song, but it’s a teach a man to fish approach rather than give a man a fish. You will be able to repeat this process for countless other melodies you wish to learn. Remember, all of the notes come from the major pentatonic scale you have already learned, memorized and practiced. Trust your ear to make what I call a very educated guess as to the next notes. They will all be part of this 5 note scale. The 2 passing notes I mentioned that are not in the scale should also be relatively easy to hear since they will stand out as the oddballs. There are only 2 different 8 bar sections to learn. The verse and the chorus. The verse starts on 2 of the major pentatonic scale and the melody moves mostly in steps within the scale. Look out for an oddball note towards the end of the verse. The chorus starts on 6 of the major pentatonic scale. There are some skips within the scale for this part of the melody. For example it skips from 1 to 5 and back to 1. Look out for another passing note that is not part of our pentatonic scale. If you are familiar with this song, it should not take you too long to figure out the notes, since the melody is very simple and repetitive. Just keep your ears open and listen carefully. Here is the original version on YouTube. Skip ahead to 1:15 for the beginning of the song. While playing along with the original recording, try to match the way Adele phrases the melody. Copy the length of her notes and the embellishments that she adds. Also pay attention to her dynamics and how she attacks and finishes notes. The more details and nuances you can lift from good singers, the better your saxophone playing will be. Practicing this step will help you to play more expressively and communicate more effectively with your listeners. Once you have figured out the notes and have learned and memorized the song, download the backing track I made that you hear me playing over in the lesson video above. If you haven’t already, sign up to the newsletter, and I’ll send you your free copy of the Hello MP3 backing track as well as the Play Sax by Ear Cheatsheet pdf guide. You can use this backing track for practice or performance. It’s also great for working on improvisation. 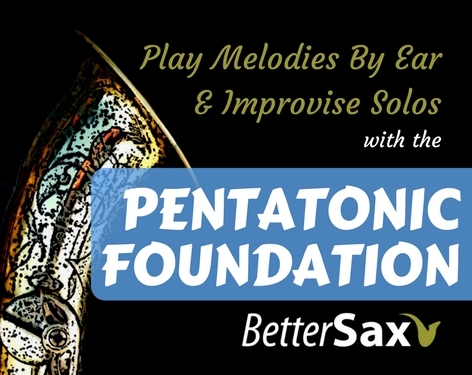 A great place to get started improvising using the same Play by Ear method is with the Pentatonic Foundation Course. Even if you are not a huge fan of Adele and this song, learning it using this Play by Ear method will be a valuable exercise in ear training. As saxophone players, our ability to play melodies by ear is very important, and the more we practice this skill, the better. Take your time, and have fun with this free lesson, and also check out my ear training lesson for playing the melody to Stand By Me. Let me know your thoughts in the comments below. Are the backing tracks still available for Stand by me and Hello? The links don’t see to be working. What downloads do you need? I can send them to you. I have to fix some of the links in this post. Thanks for pointing out the error. Looking for Stand by me and Hello backing tracks. I’ve moved all of the bonus and “free” lessons into the members section. As a member you can log in and browse all of this content along with your purchased content. The downloads are there as well. Just click on the links. A musician friend and I have to take an exam in June at our music academy. We would you like to play “Hello” (Adele) in a duet Alto sax and Tenor sax ? Could tell me if the scores for this is available somewhere with the soundtrack ? (Even if we have to pay for them). I’m sure you can purchase the sheet music for the song somewhere, but why not just learn it by ear as I show in the lesson? Hello Jay taking your lessons is being a great pleasure. Thanks a lot. I’ll soon enroll in your Pentatonic Course. I’m just waiting to settle down a little from my frequent profesional journeys.